Muffins aren’t limited to sweet versions, there are many savory types that are just as satisfying. 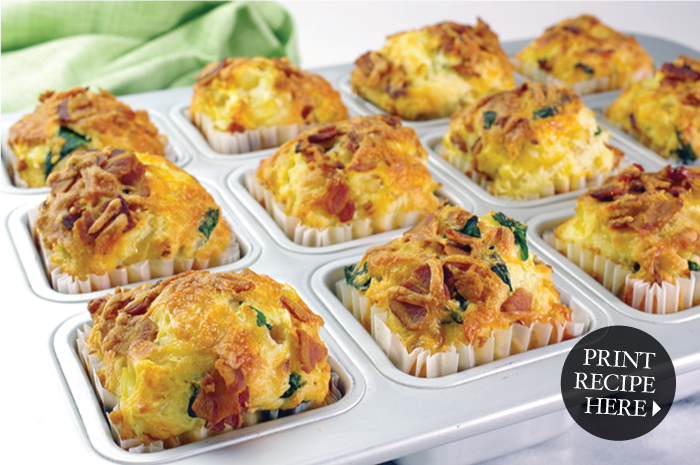 In fact, you may prefer savory muffins once you try these delicious breads loaded with spinach, bacon and cheddar cheese. We made them in “jumbo mode,” though they would be just as good in regular or mini sizes. 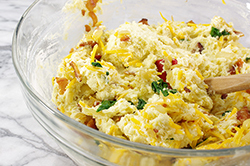 Make a big batch, enjoy a few, then freeze the rest individually for a quick breakfast on the go. Split and re-warm them in a toaster oven, or microwave. Delicious! 1. Preheat the oven to 400°F. Prepare baking pans by lightly greasing the interior sides of the baking pans, or positioning baking cup liners in each well. 2. 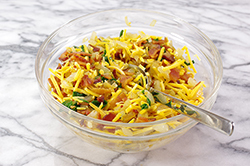 In a large skillet, brown the diced bacon until just crispy. Remove the pieces to drain on a paper towel-lined plate. 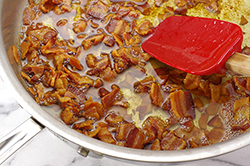 Discard any remaining bacon fat except for about two tablespoons. Sauté the onion in this reserved bacon grease until softened and translucent. Add the stemmed and torn spinach leaves to the onions and stir just until wilted. 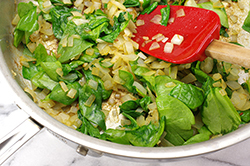 Transfer the onions and spinach to a large plate and spread to cool. 3. 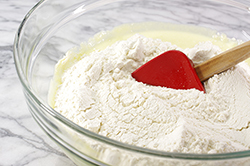 In a medium bowl, mix the flour, baking powder, baking soda, salt, and sugar together whisking well so that all the ingredients are evenly distributed throughout the flour. Set the bowl aside. 4. Melt the butter on the stovetop or for 30 seconds in the microwave. Allow to cool. 5. In a large bowl, whisk the eggs and yogurt together, and add the cooled, yet liquid butter. 6. 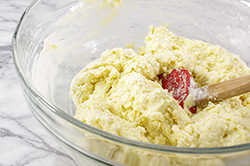 Combine wet and dry ingredients by mixing the dry ingredients into the liquid mixture. With broad strokes, fold the two together gently. 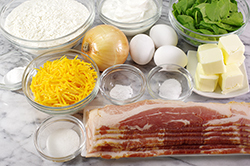 Add in the “mix-ins” (3/4 of the bacon pieces, onions, spinach and 3/4 of the cheese), and fold until just evenly combined. 7. Spoon the batter into the prepared cups until about three-quarters full. The batter will be quite thick. 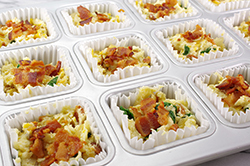 Sprinkle the reserved bacon bits and cheese shreds on top of the muffins. 8. Bake in the preheated 400°F oven for 18-20 minutes. Allow the muffins to cool slightly in the pan, then remove to a cooling rack to complete the cooling. Serve warm or cool.